The Montage at Kapalua Bay invites you to spend the month of February with us. Check out the events listed below or call us for more information. Spend an evening at a traditional Hawaiian canoe house located at Montage Kapalua Bay for a romantic dinner on Saturday, February 14 from 5pm to 9pm. For information and reservation, call (808)662-6681.(808)662-6681. An island must for lovers! 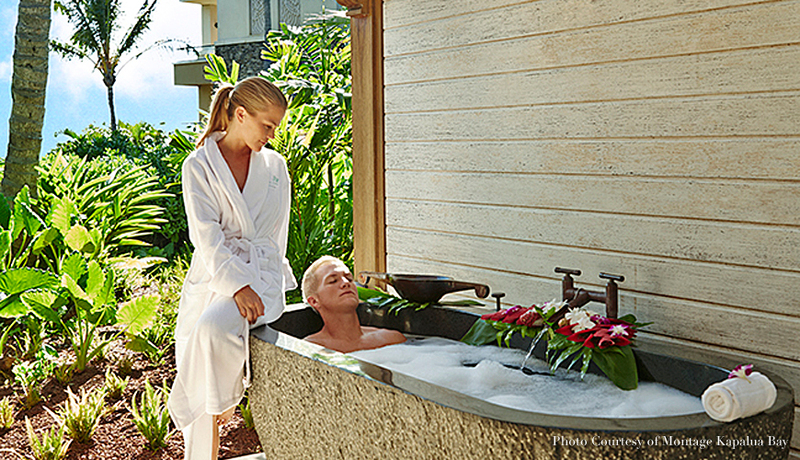 Share a passion fruit and coconut milk couple’s bath in a stone-carve outdoor tub and customized side-by-side massages in a breathtaking private, outdoor treatment room. A luscious tropical fruit platter, beverages and leisurely lunch beside the ocean-view infinity pool complete this romantic spa escape. $475 per couple /90 minutes. For information and reservation, call (808)665-8282.(808)665-8282. Let our friendly recreation team entertain your young ones while you enjoy a romantic evening or day on Maui. They’ll create unforgettable memories and friends during their time with us at Montage Kapalua Bay. View schedule and prices online, http://monta.ge/1KwDNOz. Experience breathtaking views of the Pacific Ocean, Moloka‘i and Lana‘i at this intimate venue. From themed dinners to memorable ceremonies or afternoon barbecues, allow us to attend to every detail of your special occasion. For information and reservation, call (808)662-6505.(808)662-6505. Led by Montage Sommelier, Vannesa Lampson. The weekly series will be held on Sunday evenings from 5:00pm and themes will vary each week. Guests will enjoy being guided through a tasting of wines and small bites from restaurant menu. Cost is $35 per person and advance reservations are requested (808)662-6681. (808)662-6681.